This paper is arranged in two sections, A and B. Section A and Section B carry equal marks and it isrecommended that you spend about one hour on each section.Section A: You are advised to attempt ALL SIX questions; the mark awarded will be the total for your best FIVE answers.Section B: Answer ONLY TWO questions. ONE objective of this section is to give you the opportunity to organize material and present ideas, including calculations and diagrams where appropriate, in a clear and logical form. If you attempt more than TWO questions in this section, marks will be awarded only for the FIRST TWO.In calculations, you are advised to show all the steps in your working, giving your answer at eachstage Calculators are allowed.You are reminded of the necessity for good English and orderly presentation in your answers. SECTION A: Answer ALL questions in this section. 1. The following table concerns some elements A-F. These letters are not the usual symbols of the elements. (ii) Two elements that belong to the same group………. (i) The formula of the compound formed between A and C.
2. Air is a mixture of elements and compounds. (a) What is a mixture? (b) Complete the following table to give the composition of air. (i) is removed when air is passed through aqueous sodium hydroxide………………………………………………..
(e) Acid rain is becoming a major environmental problem in areas with polluted air. (i) Identify one pollutant in air that causes acid rain………………………………………………………. (ii) State one environmental hazard caused by acid rain…………………………………………………..
of greenhouse effect and state its source. means. Heavier and higher boiling point fractions can be cracked to give lighter fractions. (a) What is a hydrocarbon? (b) (i). Name the method used to separate the components of crude oil. (ii) Which principle is employed in this separation technique? (d) C3H8 and C3H6 are two organic compounds which belong to different homologous series. (e) Give one environmental hazard of burning hydrocarbons. NaOH (aq), AgNC3 (aq), Ca(OH)2(aq), Na2SCO4(aq), washing soda. (iii) distinguish between ethene and ethane …………………………………………………………………………………………..
(iv) detect the presence of Fe2+ ions in impure water ……………………………………………………………………………..
(b) One of the reagents is used for water treatment. (i) Identify the reagent …………………………………………………………………………………………………. (ii) State its function ……………………………………………………………………………………………………..
(c) Two of the reagents are commonly used in the laboratory to prepare an insoluble salt. (iii) How would you obtain a pure, dry sample of the salt? (b) Calculate the quantity of electricity passed in Coulombs. (ii) Write equations for the reactions at the electrodes. (d) When the gases produced at each electrode are ignited, a reaction occurs. Write an equation for the reaction. (e) State one industrial application of electrolysis. 6. This question is on the rates of chemical reactions. (b) List any four factors that will affect the rates of the reactions above. (c) State and briefly explain any two things that can be done to increase the rate of reaction 1 above. 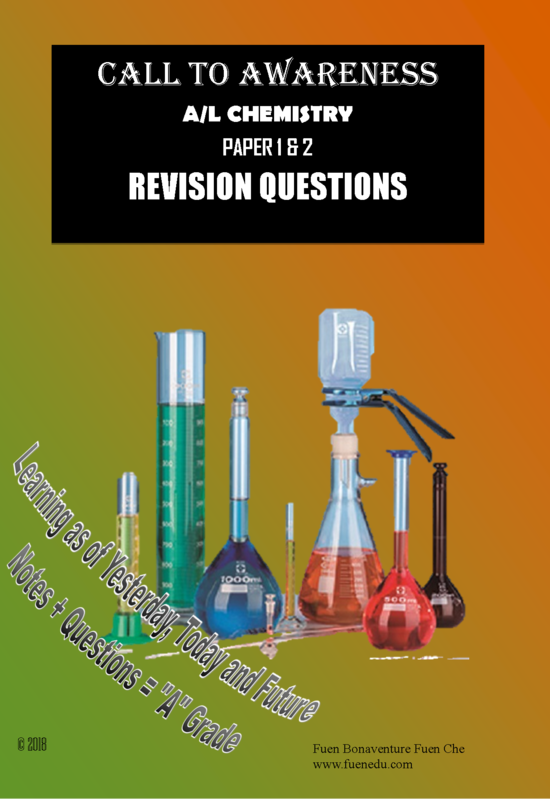 1 ………………………………………………………………….. .. ……….. … ………………………………………………………..
(d) Which of the factors that affect rates of reactions will affect reaction 2 but not reaction 3? Briefly describe how the gas produced in reaction can be identified. follow this section. Where appropriate, equations and diagrams should be given to clarify your answer. 7. (a) Define a standard solution. the concentration of dilute hydrochloric acid. Your description should go as far as collection of data. 9. Salts are generally prepared in the laboratory by the following methods. description should show clearly the starting material, the necessary equations and precautions. 10. Bridge construction and distribution of electricity by use of overhead cables are important activities in Cameroon. (a) For each activity select the metal used and describe how it is extracted from a named ore.
(b) Give the property of each metal that enables it to be used in the named activity. ok thats our priority ..i appreciate that! you are very much welcomed Charnelle!